Universal health coverage, access to medicines, and noncommunicable diseases are priorities for Switzerland in global health policy. Amb. 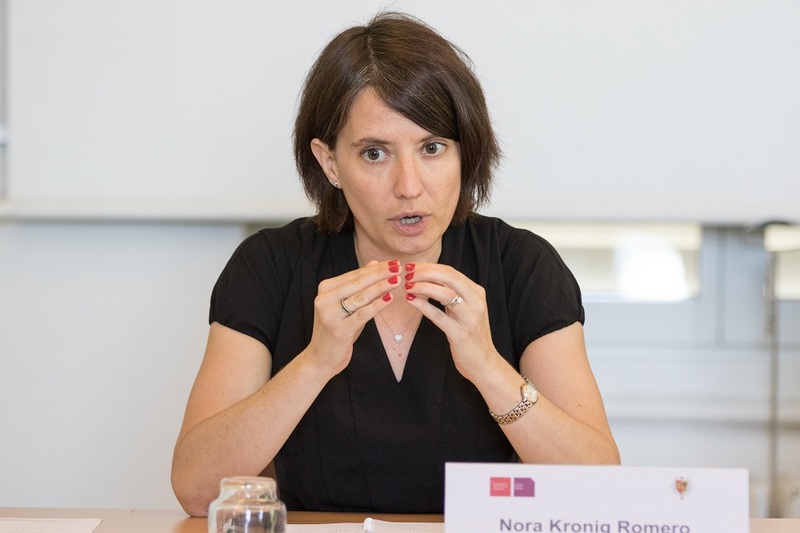 Nora Kronig Romero is the head of the International Affairs Division and Vice Director General of the Federal Office of Public Health, as well as Swiss Ambassador for Global Health. She sat down with Health Policy Watch while in Geneva last week for the meeting of the World Health Organization Executive Board, which Switzerland attended as an observer to the governing board comprised of 34 WHO member states. Health Policy Watch (HPW): What would you like to call out among the issues discussed at the Executive Board, as key to the global health policy agenda for this year? Sustainable financing of health care systems – How to make sure that everybody has access to health [care], everyone gets treated. Quality – I don’t think it is serious to look at health care systems and UHC just from the financing lens; we need to make sure that we have high quality health care systems. This brings down costs, and it insures that when you seek health care, you get treated and get the best care possible. Switzerland has been investing a lot in patient safety, we are going to host the 2020 Global Ministerial Summit on Patient Safety in Montreux. We do think it is important to look at how we make sure our hospitals are the best quality, that we don’t have nosocomial infections [transmitted in health care settings], that we promote handwashing, etcetera. UHC in Emergencies – We have launched a call for action, together with Afghanistan, looking at how can we make sure that universal health coverage actually is universal and is not disrupted when you face complicated situations, whether this is natural disasters, armed conflicts, or other fragile state situations. HPW: What aspect of UHC did you see as the key issue for the Executive Board? Kronig Romero: I think that UHC is so central and covers so many dimensions that you get into this complexity of what health really is about to different member states. I don’t really want to talk about tensions in the room because I do think the point has to be how do we understand each other. How do we find consensus? How do we find the best solutions? Every member state has a historic health care situation. We all start from our national dimension and then seek a common ground. HPW: Certainly, each country takes its national perspective and then goes forward. But Switzerland often plays a mediating or bridge-building role, so is there anything more specific that you see is a key lever in the package needed to move UHC agenda forward for the rest of the world? Kronig Romero: I think it is the financing dimension is important because it is not just a matter of shifting resources here and there in a short-term way, but something that you really must plan for, as a state. 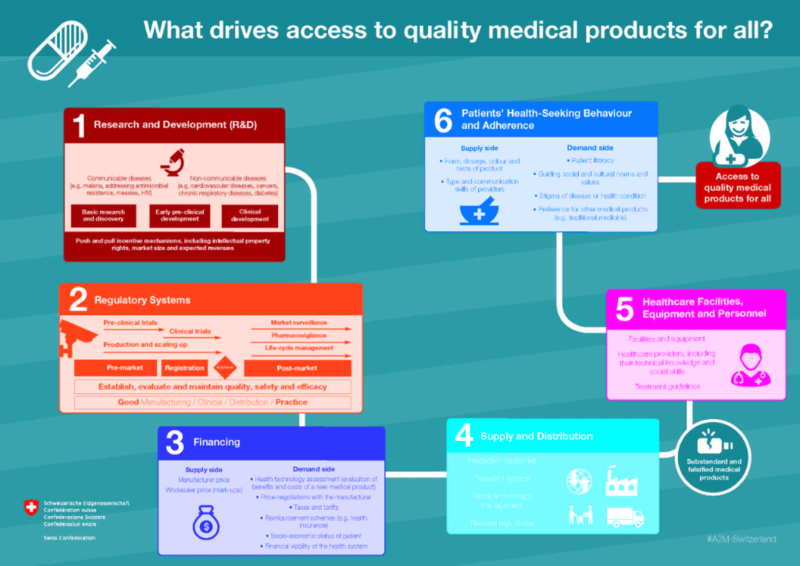 The quality dimension has a lot of potential on the development path of health and global health. And then there is the solidarity aspect of UHC, international collaboration around the topic, to make sure that we exchange and find solutions on a common ground where everybody is included. HPW: The Executive Board debate on noncommunicable diseases [NCDs] was quite heated around this “Annex 2” of the WHO director general’s report, which reported on the experiences of certain countries or cities with food labelling, pricing, or taxation to promote healthier foods. Where does Switzerland line up on this issue? Kronig Romero: In Switzerland it is NCDs that represent the highest burden of disease, so tackling NCDs is an important focus, as well as addressing the “determinants” of health [drivers] outside the health system. As a result, we were heavily engaged in the United Nations General Assembly High-Level Meeting on NCDs in September 2018 and we participated very actively in the negotiations over the declaration, which took place in New York last summer. As for the discussion at the Executive Board, it is good to have a follow-up after New York. We don’t commit to conventions or political declarations if we don’t intend to implement them. On nutrition, we have been following a very strong policy of working with the private sector, engaging in dialogue and discussion. We launched in 2015 the Milan Declaration, which was a coming together of the public sector and private sector to get commitments on lowering the levels of sugar and salt in certain products in Switzerland. The private sector has voluntarily committed to lower, in a gradual way, the sugar levels of products such as yogurts and muesli. We don’t have all of the data yet, but we are testing regularly, this has shown positive results. So on nutrition we really chose this path of voluntary dialogue and don’t really go into taxing or pricing strategies, especially for food issues. We don’t have a sugar tax. HPW: You mentioned the Milano Declaration, was this a wider European agreement? Kronig Romero: It was signed at EXPO 2015 in Milan, [which had the theme “Feeding the Planet”] and there was a Swiss House Exposition there on nutrition. But this was a Swiss agreement for the Swiss market, which had international companies that committed to the agreement. It’s a joint exercise with the Federal Food Safety and Veterinary Office, as nutrition is covered by that office. HPW: In terms of the year ahead, what other key dates, events or policy issues – either in Switzerland, Europe or globally – do you see? Kronig Romero: I really do think it is a UHC year, although I don’t think this issue will end at the end of the year. It is at the core of health. Other issues have to do with collaboration on access to medicines. It is something that we have always put a lot of priority on. It has quite a technical dimension, bringing the ministries together on a technical level to work on that. Another thing that will come up along the year is antimicrobial resistance [AMR]. We have been become convinced of the importance of international collaboration, especially on the research and development (R&D) side. We have a national strategy on proper use [of antibiotics, antivirals and other anti-microbial drugs], and are working with ministries and hospitals in Switzerland. As for R&D, we don’t think it make a lot of sense for Switzerland to do it alone. So we have been supporting The Global Antibiotic Research and Development Partnership (GARDP) as joint members, as well as the G-20 Global AMR R&D Hub, launched at the 2017 World Health Assembly. I think there will be something at this year’s World Health Assembly as well. HPW: Related to access to medicines, what are the health policy issues that you see on the table? Kronig Romero: We have been working for a few years now on framing access to medicines in a holistic way, because we think it is important to look from the demand side of access to medicines to the supply side. We have also gone beyond medicines to medical products, including also diagnostics and the whole chain of medical supplies. We have had a very successful collaboration with the actors in charge of the different aspects of the equation within the Swiss federal government in order to be active on all of these elements. We have an infographic [see graphic below] that illustrates these different aspects. For example, regulatory frameworks make access possible; this means having institutions like Swissmedic (in the case of Switzerland) to issue drug approvals. We need to make sure that [such national institutions] exist worldwide. We have had, for example, a project with western Africa, where we helped with capacity building for national regulatory institutions. Through development cooperation, we have fostered partnerships that bring together private and public sector, to try to find solutions for neglected diseases. And we have been supporting public-private institutions based in Geneva, which are trying to advance such research and development. HPW: The recent WHO report on cancer drug pricing [Cancer Drugs Unaffordable To Millions, 27/11/18, Health Policy Watch] caused quite a stir, and there were indications that even in Switzerland, drug pricing is becoming an issue? Kronig Romero: I think that the growth of the prices in certain drugs is a challenge, it is also a challenge for Switzerland, and some of the conclusions of the cancer report of WHO were also important for us. We looked at them thoroughly and analysed the options on the table. What was crystallized through the cancer report were options of measures that member states could take to reduce prices. And that brings me to the situation that we now face nationally. We do face a big challenge on making sure that we sustainably finance our health care system. I think that sustainability is the important part of the discussion. We have health care system costs that are growing every year. It has consequences for the population; premiums are going up every year, and we have done a lot of political work on the national level to see how to get the growth in costs under control without giving up on the quality of the system and while assuring access for everybody. In order to keep the prices affordable, we negotiate intensively with the industry. HPW: Did Switzerland have any significant concerns about the [WHO cancer] report or the direction that WHO is going in, so far on such issues? Kronig Romero: I do think that the report is well done, seriously done, it also underlines the aspects where there is no data, not enough data. So I do think it is solid and has a valid basis. It was really aligned to the aspects that are important to us, for example, the language on intellectual property, is really in line with what Switzerland has been engaged for, for many years, So for us, it is more a matter of now getting inspired by the report, getting a better understanding of the way it works nationally, and the possibility of increasing international cooperation on those issues. HPW: What conclusions can you take forward in your capacity as Ambassador for Global Health? Kronig Romero: The [WHO cancer] report is focused on the regional, national or local level. We do think it would be interesting to put more effort on international cooperation, and would be ready to push for increased international cooperation. We would be open to joint procurement ideas, and joint negotiation ideas, and it brings me a bit to the issue of transparency of prices. Switzerland is completely transparent, … we don’t negotiate secret deals, we really publish everything that we do. Still, we see that for the very new, high-end, innovative drugs, we have to explore different sustainable financing options. Actually, we have pushed for many years this idea of transparency of prices on the international level, and cooperation between member states. This doesn’t mean that everything is completely public, but we do think it would be important to move more in that direction. We are very committed to international collaborations and would like to advance them further. HPW: When you talk about regional cooperation in the procurement of medicines, as an example, are you considering arrangements such as those involving Austria and the Benelux countries [Belgium, Netherlands, Luxembourg]? Kronig Romero: I think the Beneluxa Initiative is a good example of one way to improve international cooperation. Switzerland has been in contact with those initiatives. I think we could take it a step forward and be very interested to commit to such initiatives. HPW: Are bilateral discussions on this issue taking place this week with Austria or others? Kronig Romero: I have all kinds of contacts during this week, so it is always a matter of using the multilateral discussions as an opportunity to have bilateral contacts with many countries. One of the positive things of being a member state that is not part of any really concrete [regional] group, is that we actually do have contacts with everybody. We are very independent in our ‘grouping’ approaches. Image Credits: GHC-S.Deshapriya, Swiss Federal Office of Public Health.